It seems to have been dark in eastern England for over a week now so no new picture this week. 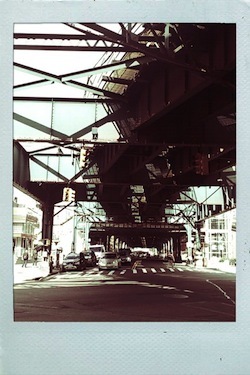 Instead, a polaroid from Long Island City, New York where the subway travels overhead past the Court Square Diner. Thanks to Peg Simone for introducing me to the delights! Originally calling themselves Tone Poet before realising a number of other bands had the same name, they eventually opted for Tone Puppets to symbolise being controlled by the tones and sounds they create. Described as being full of Eastern promise and Northern grit, Tone Puppets have been creating quite a buzz in their home city through their bi-monthly nights at The Zanzibar, which was emphasised when they won a free recording session on a public vote for Gig Of The Week at Liverpool Music Week. Her first musical release was the acoustic soundtrack for the feature film 29 Palms, but Daisy really made people take notice in 2009 when she formed an uncommon bond with renowned musician/producer Alain Johannes (Eleven and Them Crooked Vultures) to record her first studio album. More than just an EP, the six songs paid homage to Topanga and the artist collective that nurtured her. The EP, aptly titled, The Rodeo Grounds is a collection of earthy and soulful poems and stories tracing the ins and outs of living magic, love, and broken hearts. 2010 found Daisy playing gigs in L.A. with her new bandmates Mike McGill (VHS or Beta, Lyra, Indians) and Sal Romano (Lyra), the two gentlemen with whom she would eventually record her debut full-length album, God Willing. Aside from proving that Daisy McCrackin is “one of the most promising singer-songwriters of today,” her debut full-length mines the realm that hovers elegantly between sweet simplicity and searching depth. God Willing, and it’s nine tracks of haunting beauty, which was released in September. Just the first four minutes or so of 23 year old Tigran Mimosa’s September Mixtape as a taste of his talent which is allegedly even better expressed on his debut full-length album released a couple of weeks ago on False Idol Musik. . It was in Brooklyn, NY where MiM0SA found refuge as he wrote, recorded and produced his album “Sanctuary”. While his previous EP release “58 Degrees” favoured a more grittier fusion of unrelenting beats and grime, “Sanctuary” works as one cohesive whole piece of work that finds MiM0SA immersed in rhythm, encompassing and centred around the 808 drum kit. However, the album carries an authenticity by which MiM0SA’s aesthetic appreciation of the origin of sound is fused with layers of various styles, textures, and grooves that embrace Dubstep, HipHop, 2-step, Moombahton, Dub, and Downtempo. A quietly spoken yet powerful track from Suzanne Doyle who performed all over Toronto in the summer of 1971, earning a featured performer spot at the opening of Ontario Place. Doyle’s dreams of becoming a rock star were on the verge of coming true, in large part due to a talent for crafting powerful, image-driven lyrics full of substance and a bit of magic. Doyle’s family, farmers by trade, soon tired of the big city and returned to a more pastoral setting. As the bright lights of the city faded, so too did the prospects for Doyle’s music career. Still, that small voice called out to her. The muse would have to wait, however. Fast forward to a couple of years ago and Doyle, who hadn’t written a song in years, found a well of material waiting to be written, born of a lifetime of experiences. Her debut album, 2009’s Room With A View, quickly established her as a powerful, yet mature, new voice in the world of Canadian folk music. I couldn’t resist the temptation to slip another track from Franco into the show. Although the name Franco & The Dreadnought suggests the project is a full band effort, Franco actually plays all of the instruments on his recordings; the Dreadnought being his Martin DXME Dreadnought acoustic guitar. Since going solo, Franco has been creating a name for himself on the festival circuit resulting in a number of other opportunities coming his way which is enabling his music to be heard by more people. Further information on Franco & The Dreadnoughts including information on how you can download his new 6 track EP for free can be found on his Facebook site and executed at Soundcloud. Having left Chicago, where he and his band were consistent local favorites, front-man Josiah Mazzaschi has begun to carve out a distinctive place in LA’s Silverlake music scene. Amid the sunny weather, the huge talent pool and myriad outlets for Light FM, Josiah knew he had arrived where he needed to be, and he quickly found himself working as a studio engineer and producer at some of the city’s premier recording studios. In less than two short years, he became so sought after that he founded his own studio, The Cave. However, not content to be simply behind the board, Josiah knew that he had to reform the band he had started in the Windy City, and Light FM was reborn. Currently, Light FM is a four-piece with Josiah on lead guitars and lead vocals, Nicki Nevlin on bass, Jimmy Lucido on drums and Savannah Wheeler on keyboards and backing vocals.